To my surprise it seems that the majority of people interested in using the VFP Entity Framework Provider are targeting Free Tables. Fortunately, I took special care during development of the provider to ensure that it would work as best as it could with Free Tables. 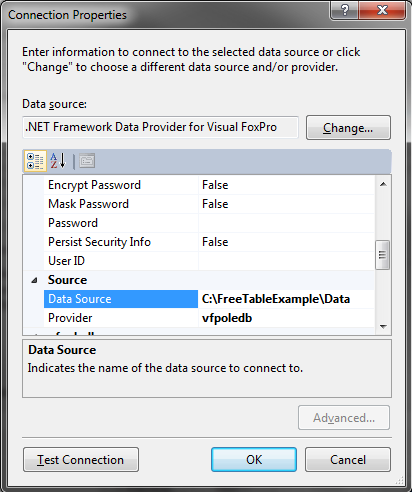 In this blog entry I’ll walk through an example using the provider with Free Tables. For this example I will “borrow” the blog Free Table DBFs from the Web Connection shareware download. Create a simple console application. 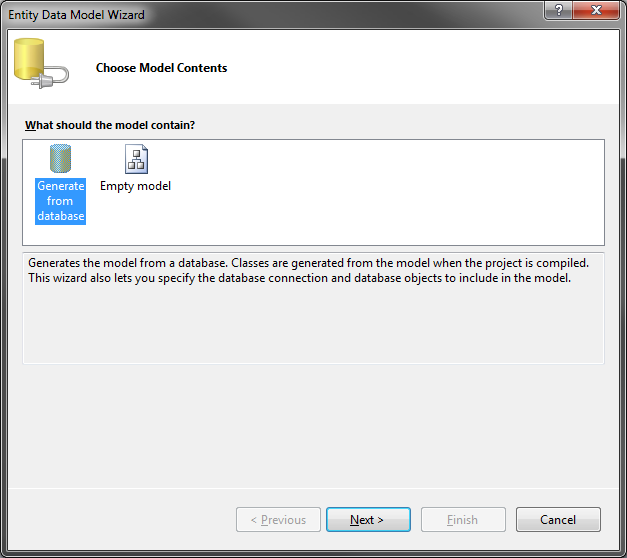 Create the Entity Framework Data Model. 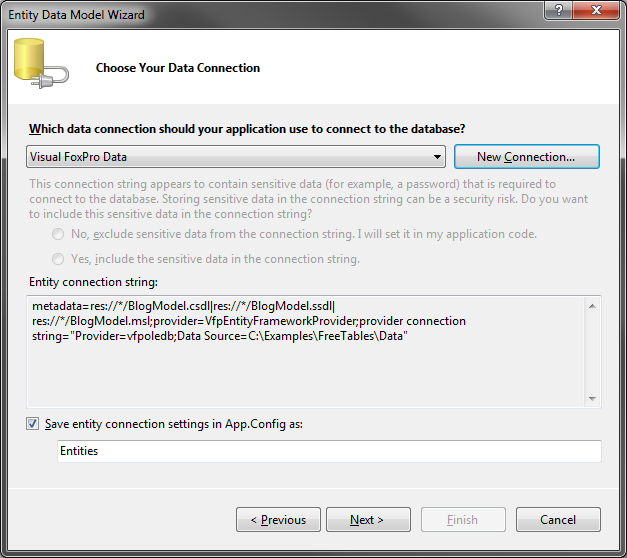 Select “ADO.NET Entity Data Model” and enter BlogModel as the name. Don’t need to change anything on this screen. Just click next. 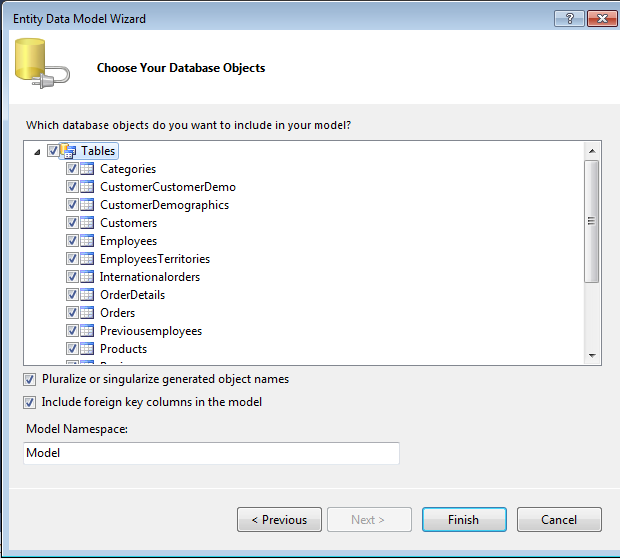 Here is the Entity Framework Model that was created. The Model has been created and we are ready to query the data. 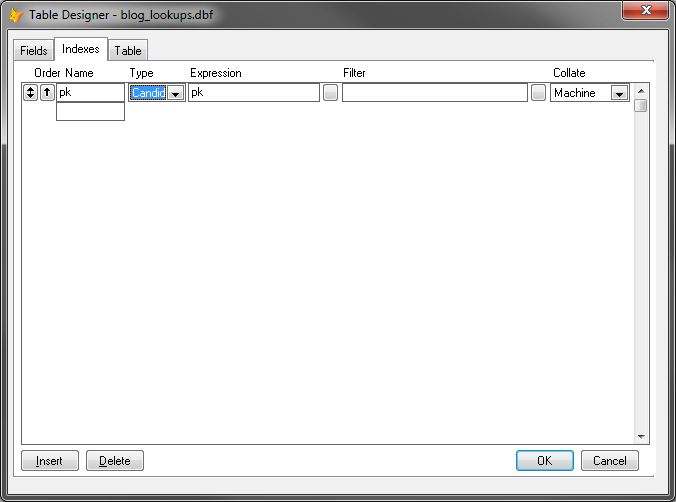 For this example, I want to query the Blog_Lookups table. Here is the Model. Notice the key icon on all the properties? Add this to the list of things that will be discussed later. Here is an example of querying the data sending it to the console. Lets take a second to recap what we’ve done. We create a project that included an Entity Framework Model that was created from Free Tables and we were able to query these tables. All this basically happened in the matter of minutes. I know, I know… you could’ve done this quicker in VFP but still getting this done in minutes in .Net is pretty cool… huh? 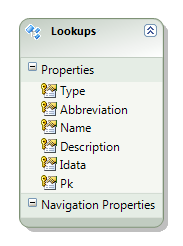 Did you notice that when I wrote to the console I conceptualized some of the Model property names? I wrote out a label of “Abbreviation” instead of “Cdata”, “Name” instead of “Cdata1”, and “Description” instead of “Cdata2.” Well the cool thing with ORMs, such as Entity Framework, is that you can make such changes to the Model. More specifically what I’m trying to point out is that the Model property names do not need to match the table column names. I personally find the ability to change the property names useful when having to deal with the Free Table’s 10 character column name limitation. Additionally, you can change change the Entity name without needing to change the table name. Here is an example of modifying the Model (just the Model was changed… not the underlying table). Ok, we have a Model and we even tweaked it so that our code is a little more readable (by changing the Entity name and property names)… so what is next? Well, we’d like to modify the data right? Here is code to find an Entity, change the Name, and then save the change. 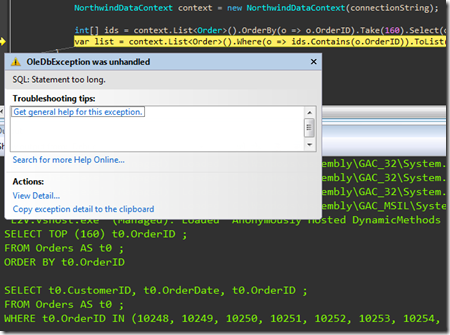 Looking at the exception message, what does it mean that the “Name” is part of the object’s key information mean…? Remember the issues that I pushed off for a “discussion later?” Well now is the time. The update didn’t work due to these two issues (which is really one issue). The first issue was the Warnings and Messages in the Error List. Here is the Error List that relates to the Blog_Lookups. The second issue is the key indicator on all the properties. Entity Framework, by default, uses all the properties as a composite primary key when it cannot identify an actual primary key for the table. When it does this it actually places the Model in a read-only state which is why the update fails. So how do we fix these issues (errr… this issue)? Well the Error List clearly states that we are missing a primary key on the table doesn’t it? 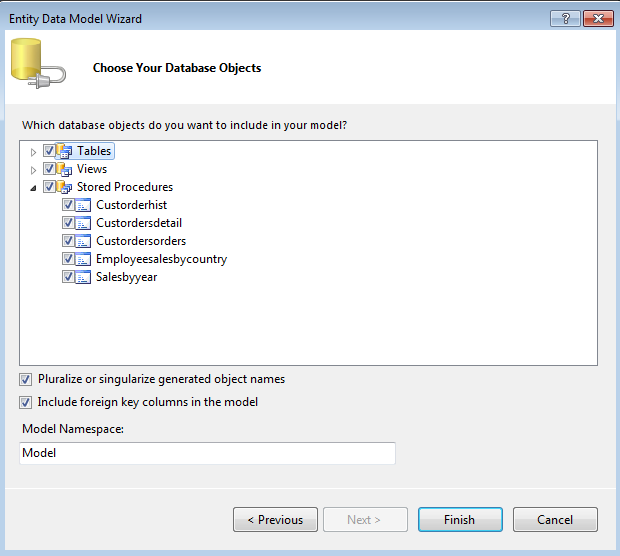 * There is another way to modify the model without changing the table structure. If you are interested in this option I’d suggest reading Julia Lerman’s Programming Entity Framework, Second Edition book to learn how to modify the xml that defines the Models. Another VFP EF Provider build is ready for testing. The focus of this build was to get the provider to work with “Code First” scenarios. The remainder of this blog entry will walk you though a simple example of using Code First. This example was derived from the ADO.NET team blog – EF 4.2 Code First Walkthrough. File –> New –> Project.. 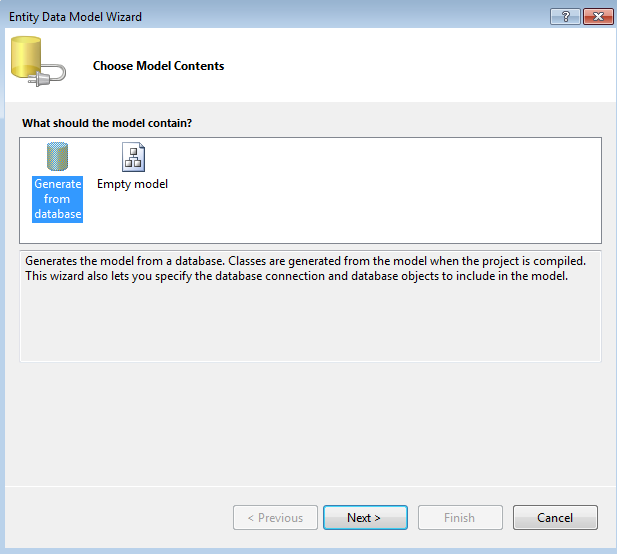 This example deviates from the ADO.NET team blog – EF 4.2 Code First Walkthrough when defining the model classes (Category and Product). The MaxLength attribute was added to let the provider know that the table field should be varchar instead of a memo. Add the provider information and connection string to app.config. 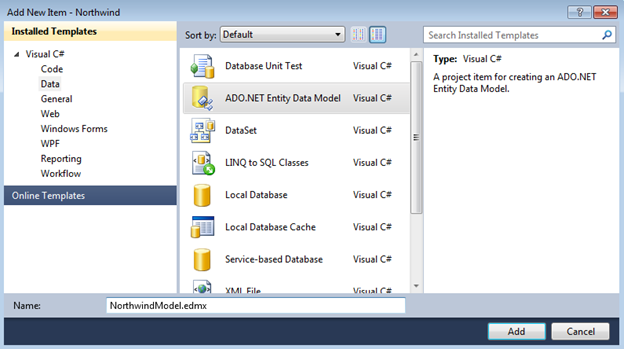 <add name="Vfp Entity Framework Provider"
Run the application and then check the database container directory to see that the data files have been created. I’m back it again… working on another LINQ provider for Visual FoxPro data. Introduced back in 2009, LINQ to VFP was my first attempt at writing a LINQ provider that accessed Visual FoxPro data. That provider worked well but had a few drawbacks that I was willing to live with at the time due to the lack of options. The most notable drawbacks include not having a designer/code generator and requiring special code to get it to work with other Microsoft offerings such as WCF Data Services. Additionally, there were some usability limitations due the framework that LINQ to VFP was build upon (IQToolkit). I was able to code my way around most of these issues but I still felt that the whole process wasn’t all that developer friendly. What I really wanted was a more integrated development process that could easily hook into new Microsoft offerings (such as LightSwitch). So I started to look into what it would take to create an Entity Framework 4 Provider. Fortunately I found that there was a starter project available. I modified this project to work with Visual FoxPro data and now have what I’d like to consider a proof-of-concept build ready for testing. * Note: This build only works for “Database first” scenarios. A sample application (VfpEFQuerySamples) is available to see the provider in action. 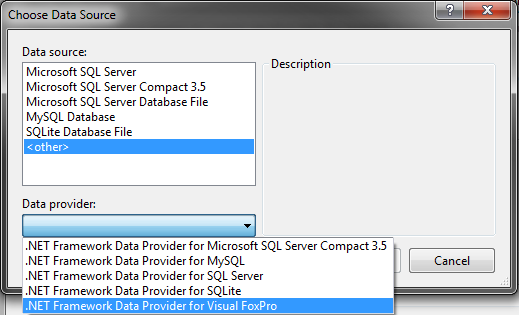 This application is a copy of the ADO.NET Entity Framework Query Samples configured to work with Visual FoxPro data. Download and run the VfpEntityFrameworkProvider.msi from the codeplex site. * UPDATE: Starting with version 0.6.1, the installer will update the machine.config so no need to manually make this change. Add an entry for the provider in C:WindowsMicrosoft.NETFrameworkv4.0.30319configmachine.config. After completing all the wizard screens you will see the EF designer and depending on your data you may see messages similar to the following. This is expected behavior from the Entity Framework and is not specific to the Visual FoxPro Entity Framework Provider. There are two options for deploying an application using this provider. Both options required the provider information to be added to the machine.config or the project’s app.config/web.config. Install the VfpEntityFrameworkProvider.msi. 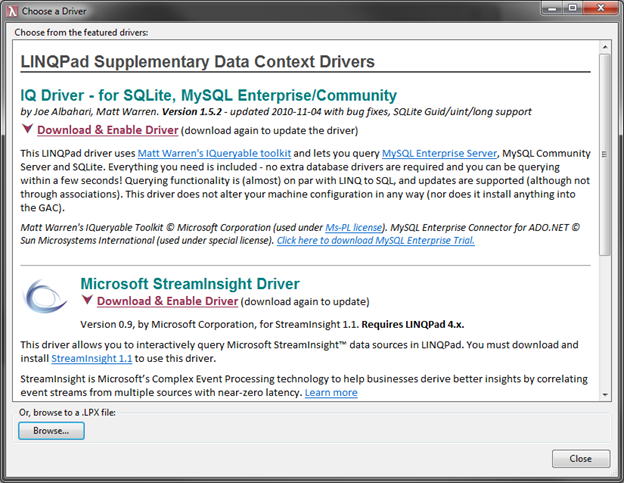 This installer includes the VfpOleDb driver. 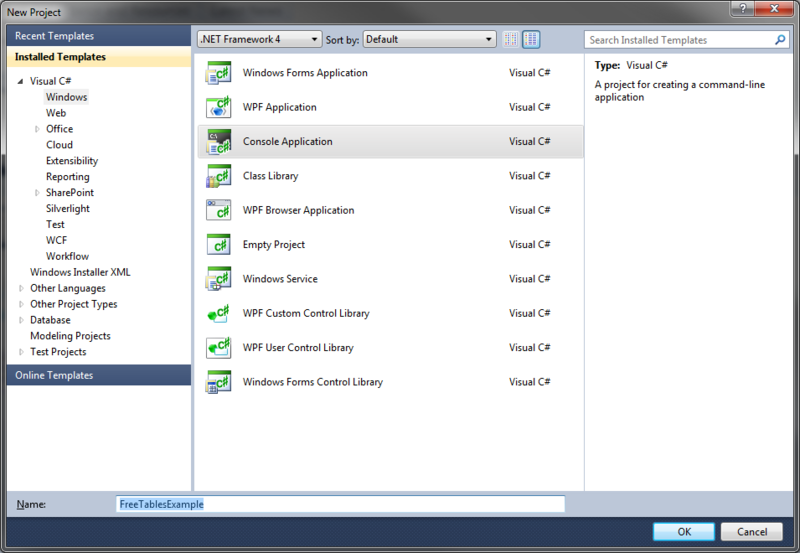 Include the VfpEntityFrameworkProvider.dll in the project. 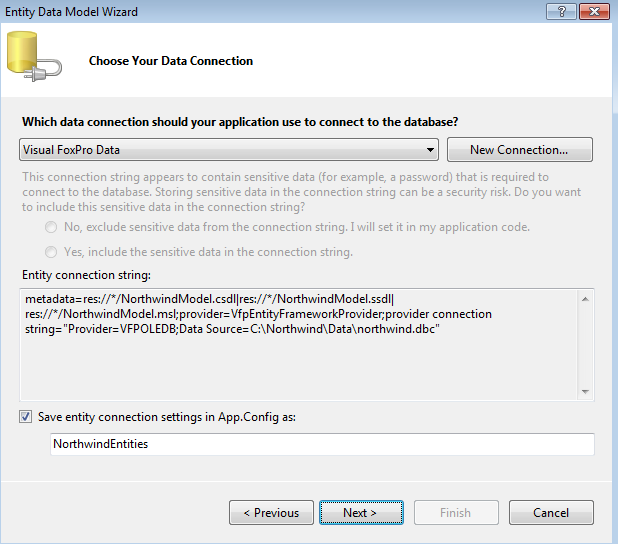 You will also need to ensure that the VfpOleDb driver is installed. I haven’t figured out how to hook into “Generate Database” screen so it currently shows commands for Sql Server instead of Vfp. 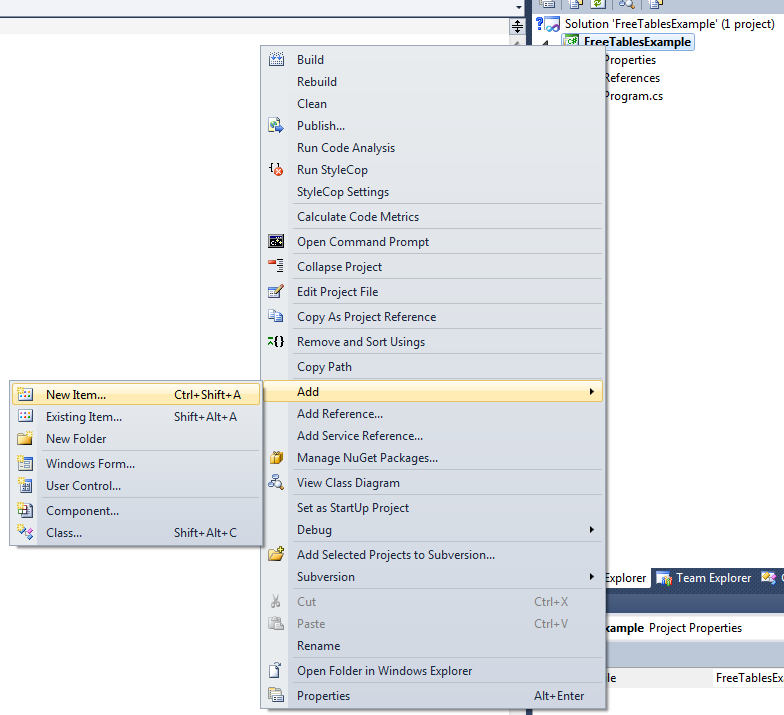 The provider only woks in the non-Express versions of Visual Studio. This is not because I’m intentionally restricting the Express Products but instead because I haven’t figured out the registry settings yet. The default IQToolkit Insert method always seemed a little odd to me in that it didn’t populate an auto generated primary key property after executing the Insert statement. The following image demonstrates this issue. Notice how the Categoryid is 0 after the insert. The toolkit does provide a way to get the primary key value but the process isn’t very intuitive (especially after working with other ORMs like LINQ to SQL). Here is how the toolkit provides a way to get the primary key value. One problem with this approach is that it isn’t an option when using the Unit of Work (EntitySession) approach. Personally, I ‘d rather have a simpler approach such as the following. To achieve this simpler approach I needed to create a class that could handle the inserting of an Entity. This class needed to read the mapping information to see if the Entity had an auto-generated primary key. If the Entity did have an auto-generated primary key then the class needed to create an Insert function that could retrieve the new value and set it on the Entity instance. However, if the Entity didn’t have an auto-generated primary key the class would return a function that called the standard IQToolkit Insert method. /// the Entity's Primary Key property is updated after the Insert. /// Executes the Insert for the Entity. /// the extra step of retrieving the AutoGenerated primary key. // Create a type array for the generic types for the Insert<T, S> method. // Set the primary key property to the new Id value. // Assuming if we got this far without an exception then the insert worked. // Do the insert statement as normal if the Entity doesn't have an AutoGenerated primary key. /// Gets a reference to the IQToolkit.Updatable.Insert method. // Create type for Expression<Func<T, S>>. // Create an Expression Parameter. // Create a Lambda Expression for the Func<T, S> call. /// Use reflection to determine if the primary key column was mapped as a generated column. // Get a reference to the internal method GetMappingMember. 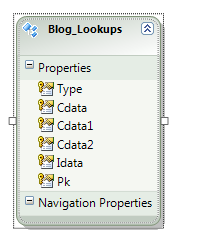 // Get the Column property from the mappingMember. /// primary keys don't need to be retrieved after executing the Insert statement. The next step was to hook the DbEntityInserter into the IQToolkit insert process. This was handled by creating a decorator class that implemented IEntityTable. 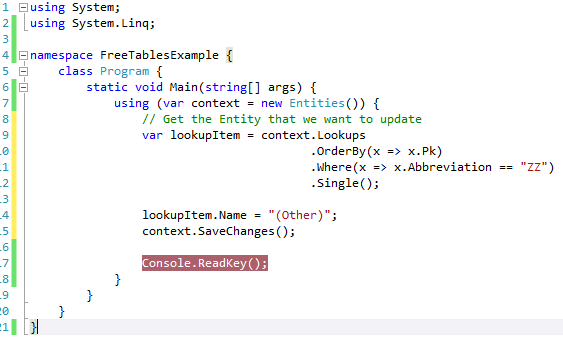 /// This class wraps the actions to the EntityTable to provide a hook into the Insert method. // Using the DbEntityInserter to handle the insert. The final step was to simply hook into the Provider’s GetTable method and return an instance of the DbEntityTable. * This base class and a unit of work version can be found in the IQToolkitContrib download. 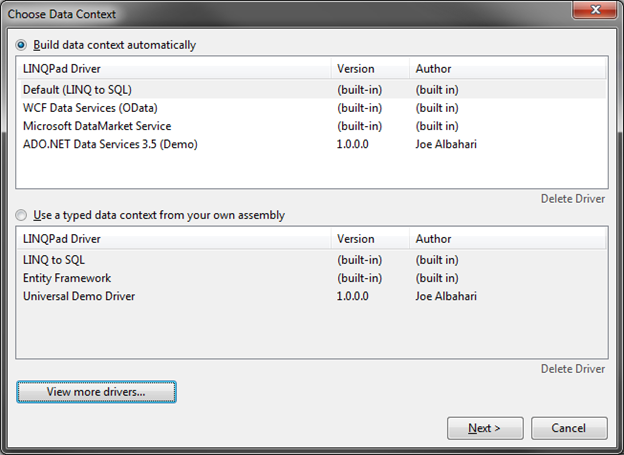 This blog entry provides a simple overview on how to use the driver. The first thing you need to do is get the driver – which can be found in the LINQ to VFP download or as part of the NuGet download. Connect to your database container (or free tables directory). Enter a full connection string or click the “Locate Database Container…” link which will build a connection string for you. After installing the driver and setting up your connection you can start querying and manipulating your data. 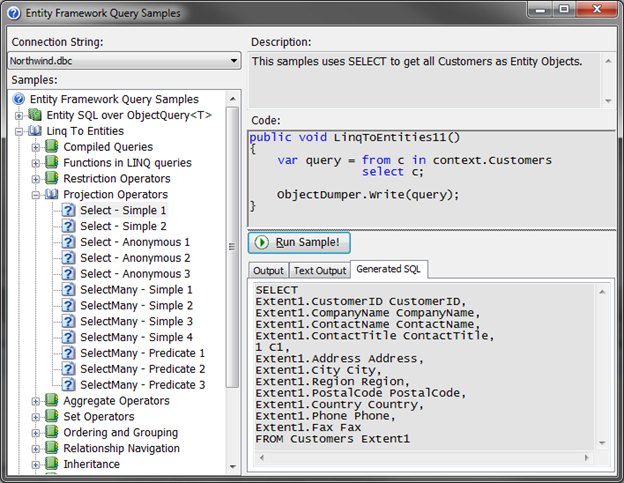 Here is an example of a query. 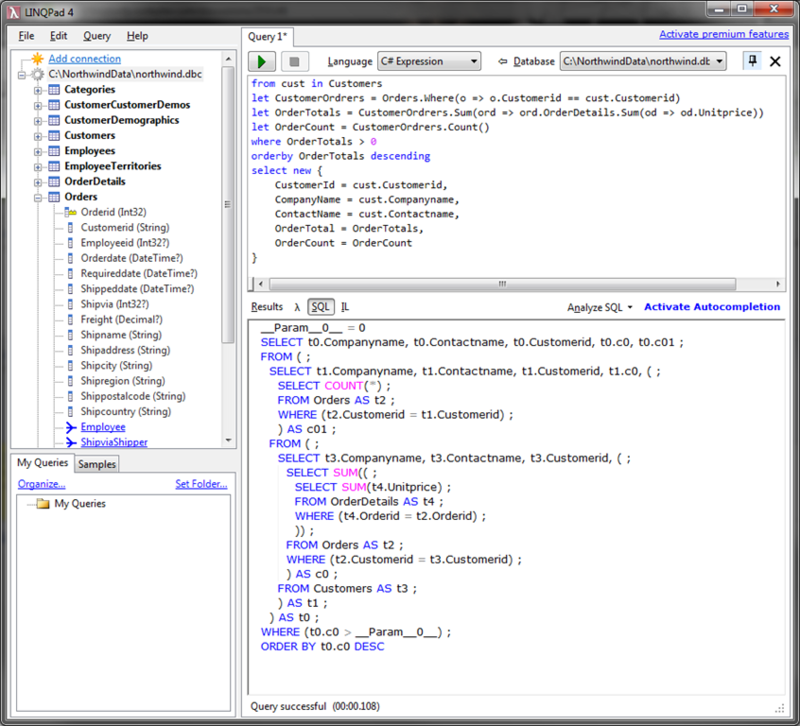 You can also see the generated sql command. Here is an example of manipulating the data. 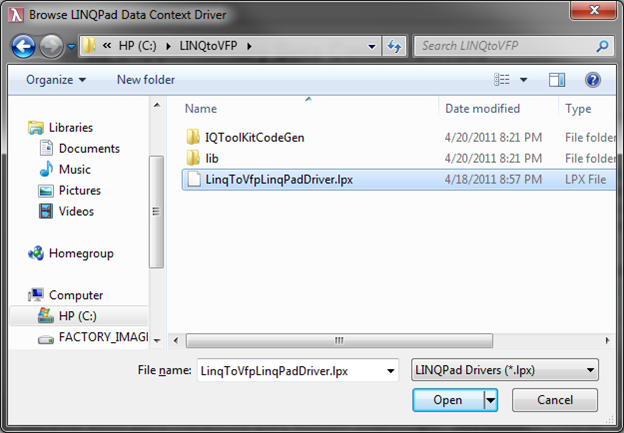 * Cetin Basoz posted a video showing how to install the LINQPad driver. About a year ago I wrote a blog entry explaining a change that was made to LINQ to VFP to help prevent the VFP error “1812 – Statement too long.” To be honest, I was never really satisfied with the solution… but at the time it seemed to be the only way I could deal with this annoying VFP error. Fortunately though, a much more knowledgeable VFP developer, Cetin Basoz, stumbled upon my blog entry and offered a more elegant solution to this problem. He pointed me to a link, that pre-dated my blog entry by a couple years, that suggested using the VFP’s XmlToCursor function instead of creating temp tables. Needless to say, I took his advice and modified LINQ to VFP accordingly. In this blog entry, I will provide more details on a scenario that resulted in the VFP error, how it can be dealt with using ADO.Net, and the changes made to LINQ to VFP to avoid this error. As a VFP developer, I’ve picked up a project that has been in production for many years. Prior to my involvement, a senior developer convinced the project owner that the company needed to move away from DBFs and start using SQL Server. The convincing argument had something to do with preventing corrupted memo files and index files. The product owner was tired of hearing from the support team that the customer had to lose some data due to these issues. In an effort to move forward, it was decided that new tables could only be created in SQL Server. Existing table would be move to SQL Server at a later time to be determined when it is more convenient. Unfortunately, the project owners never found a convenient time for converting the core tables. This ultimately resulted in a fractured data system which consequently produced less than optimal query performance. This chain of events provides a very general idea of what led to the VFP error. 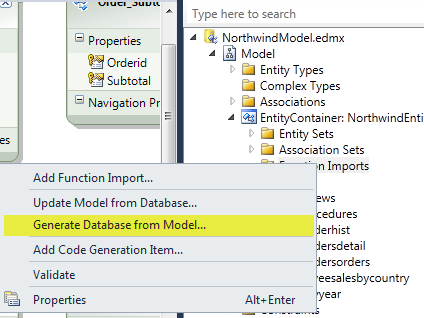 Now lets dig into this idea a little more with a concrete example using the Northwind database. Assume that at one time an Order could be for only one Product and all the information was stored in the Orders table. This data model seemed to satisfy the business needs for awhile but as time went on various pain points were attributed to this design. Consequently, it was decided that it was time to create an Orders Details table so that multiple Products could be part of a single Order. The new Order Details table would be created in SQL Server while the Orders and Products tables remained DBFs. The product owner decided that what the application could really use is a report that provides a list of Customers that have received discounts on any Products. This would have been a trivial work item had the data been in one data system but now that it spread across two data systems this will require several steps. Finally, after a long winded setup of the scenario I’ve gotten back to the decision point in my last post where I decided I needed to use temp tables to get passed this issue. There is one main consideration that you would want to keep in mind when using XmlToCursor as I have in this example. The generated xml didn’t include any schema information which resulted in VFP making an assumption as to the expected data type. VFP’s assumption worked out for this example. But if the OrderId column had been a string this query would have failed due to a data type mismatch. To correct this issue, the xml would have to include a schema that explicitly identified the data type. To help deal with this issue, I wrote a class that would convert an array to XmlToCursor formatted xml which would include the schema when necessary. // Try to get the actual array type incase it requires schema information in the xml. At this point, I’ve explained a basic scenario that has required the XmlToCursor function. 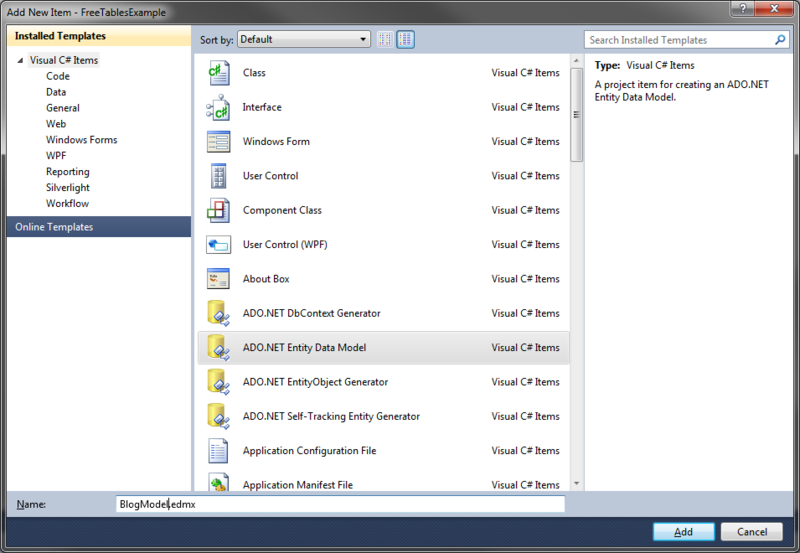 I’ve also shown how the function can be used in ADO.net. So how does this XmlToCursor stuff affect LINQ to VFP…? Before becoming aware of the potential usage of XmlToCursor I had included some temp table helper classes in LINQ to VFP. These classes got the job done but resulted in some very messy code because it required branching the code to handle queries that contained too many array items (see code below). In addition to less than desirable code, the LINQ to VFP developer had to evaluate each query to determine if it had potential of causing the “statement too long” error. What I think would have been much better is if LINQ to VFP evaluated the query to determine the array length so that it could modify the select statement as needed. In retrospect, I probably could have made the select statement rewrite happen with the temp tables but it just didn’t seem like the right thing to do at the time. Nevertheless, this essentially describes the process that was included when LINQ to VFP was changed to use XmlToCursor. In addition to this new process I have added a new setting that is used to opt-in to the whole XmlToCursor rewrite process. Here is the previous code example rewritten so that the sql select statement includes the XmlToCursor function. I’ve been working on a project that uses WCF Data Services for data access on a DMZ server. The application was designed to work directly with LINQ to VFP on the intranet but use WCF Data Services on the extranet/DMZ server. During development I noticed that in some cases the queries over WCF Data Services didn’t exactly match the direct LINQ to VFP queries. What I found was the Expression Tree for the queries that required an upper(alltrim()) (to utilize indexes) had included some extra null checking Expressions. Here is an example of the issue. The extra null checking makes sense given the fact that WCF Data Services can be used with Data Sources other than ORMs. 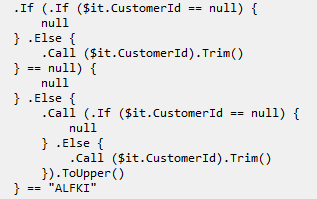 However, this really made a mess of the Select Statement created by LINQ to VFP. More importantly the query was unable to utilize the index. Correcting this issue wasn’t that difficult once it had been identified. I added the following Visitor class to remove the unnecessary null checking Expressions. In the last 10 years or so that I’ve been working with VFP I’ve only encountered the “Statement too long” error a handful of times. Within VFP, I found that this error could be handled in two ways. One way to handle this error is to simply rewrite the SQL Statement. Another way, which I only recently discovered, was to use a sys() command. Here is a quick VFP example using the Northwind database. I have a function that accepts a parameter which is a comma delimited list of Order Ids. The parameter is passed into a simple SQL Select statement.
" into cursor curOrders "
This method works fine when there are a limited amount of Order Ids but when there are a couple hundred Order Ids the statement fails. This statement can easily be rewritten using a join statement to prevent the “Statement too long” error. An alternative option to re-writing the statement is to use the SYS(3055) command. Ok so I have a simple work around for this error in VFP. Now what about .Net…? Here is the same example re-written in C#. "10398", "10399", "10400", "10401", "10402", "10403", "10404", "10405", "10406", "10407"
When I run this code I get the same “Statement too long” error. Out of the two ways that I know of to correct this issue… Using the SYS(3055) command would be the easiest to implement. So I modified the code to include the SYS(3055) command. No luck… the simple solution didn’t work. 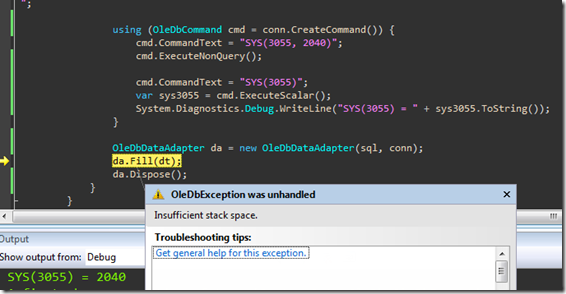 Adding the SYS(3055) command just changed the error message to “Insufficient stack space.” Researching this error led me back to SYS(3055) which clearly isn’t a fix for .Net. I still have two options at this point. 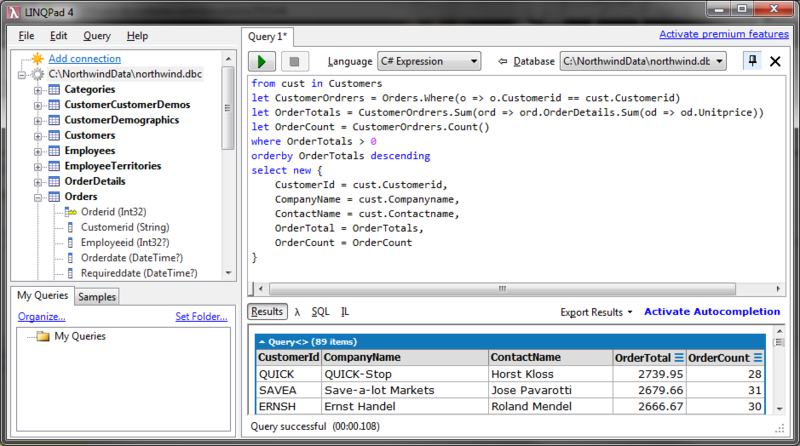 I can pull all the Orders into a DataTable and then filter the results in .Net. Using LINQ to DataSets with this option would have a nice feel to it… it would seem similar to processing the data in VFP but it would come at a heavy performance cost (assuming the data was a larger data set than the Northwind.dbc). Needless to say I’d like to avoid this option if possible so I’ll move on to my last idea. I need to rewrite the query to use an inner join as I did in the VFP code. To pull this off I will need to create a temporary table to hold the Order Ids. 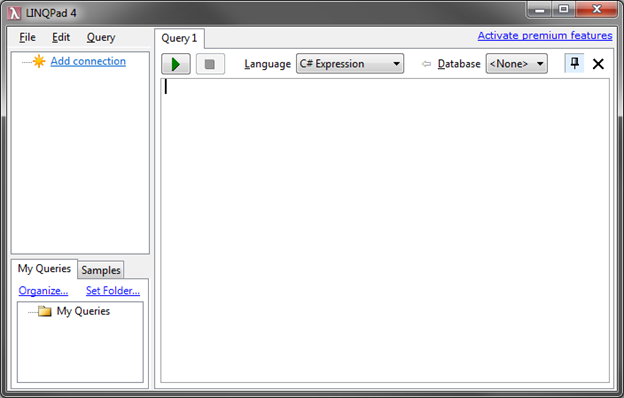 Great, I got a proof of concept to work using standard ADO.Net. Now I’d like to get this to work with LINQ to VFP. Here is the example rewritten with LINQ to VFP. 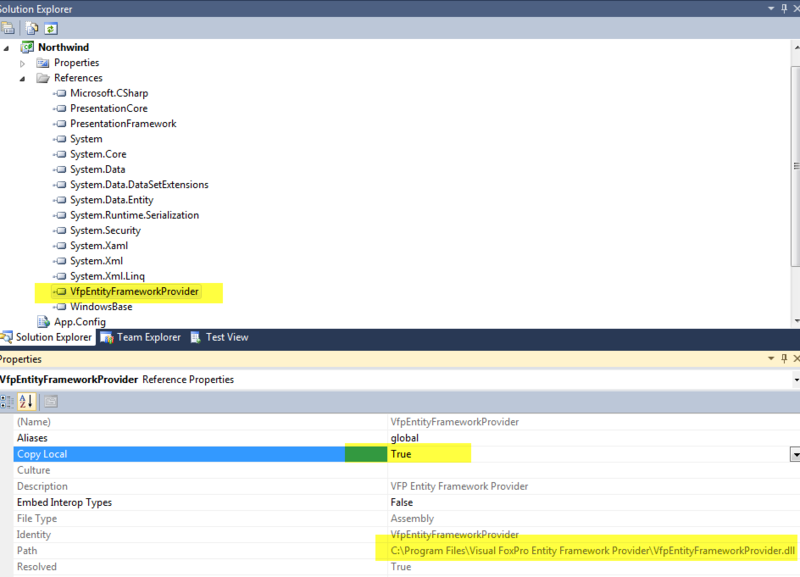 Rewriting the LINQ to VFP statement isn’t as simple as it was in VFP or using standard ADO.Net. 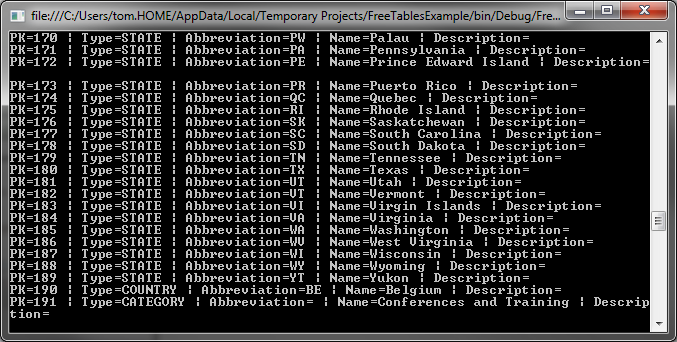 The temporary table needs an Entity class and this Entity class will need to be mapped to the temporary table. Plus I will need to be able to pass the full temporary file path as the Table Id. After a few attempts I found that I could not pull this off without modifying the LINQ to VFP code. So I modified the VfpQueryProvider to include a new method that would create and map the temporary table. 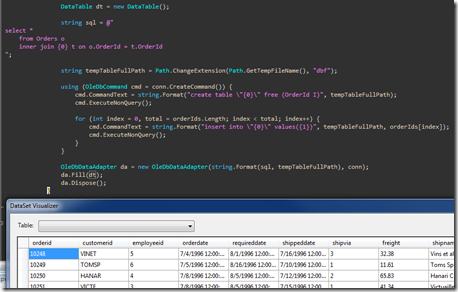 Here is an example of the rewritten LINQ to VFP statement using the temporary table. * One thing to note about the TempTable class is that it implements IDisposable. The dispose method will delete the temporary file so keep this in mind if you are using the TempTable when passing around IQueryable. In this case you need to make sure the Dispose method isn’t called before executing the query. Creating a temporary table is going to add a little extra processing time so this should only be used if needed. Here is an example that of how I’m using this in my production code. When I first started using LINQ to VFP I didn’t mind manually writing Entity classes and mapping the data but after awhile I found it to become a tedious task. So I decided to write a code generation application that would work with LINQ to VFP and the IQToolkit SQL Server Provider. This application has really turned out to be a play thing for me so that I can get some hands on learning with WPF and Spark View Engine. But before I’d allow myself to get to far into playing around I wanted to make sure I got the core functionality done. At this point I have an alpha build available for anyone interested. 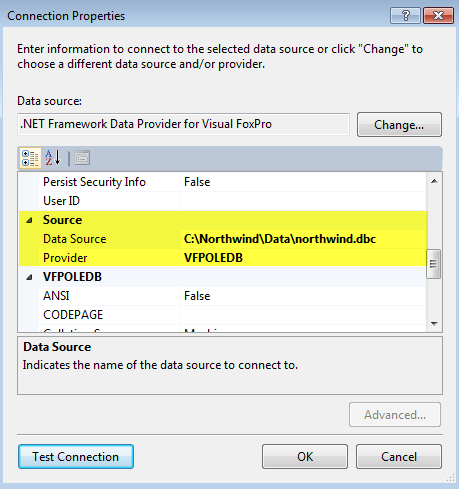 As expected, you can use a full connection string to access VFP or SQL Server. There are also a few unconventional connection options. You can specify the full path to a dbc file or a specify a directory for free tables. 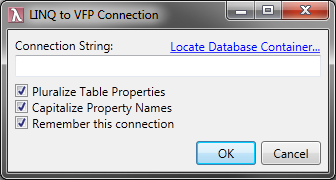 Both of these options will be used to create a connection string for VFP. 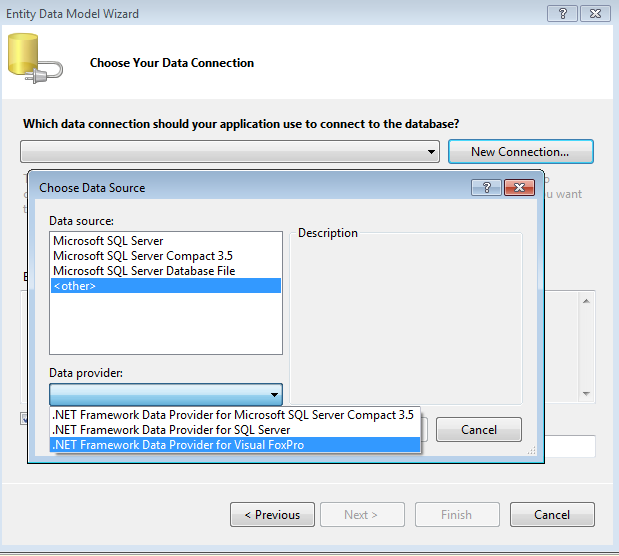 You can also provide a modified version of a SQL Server connection string that includes a pipe delimited list of databases (Example: Data Source=. ;Initial Catalog=Northwind|AspNet;Integrated Security=True). The Data Context Settings were designed with two different Data Contexts types in mind. 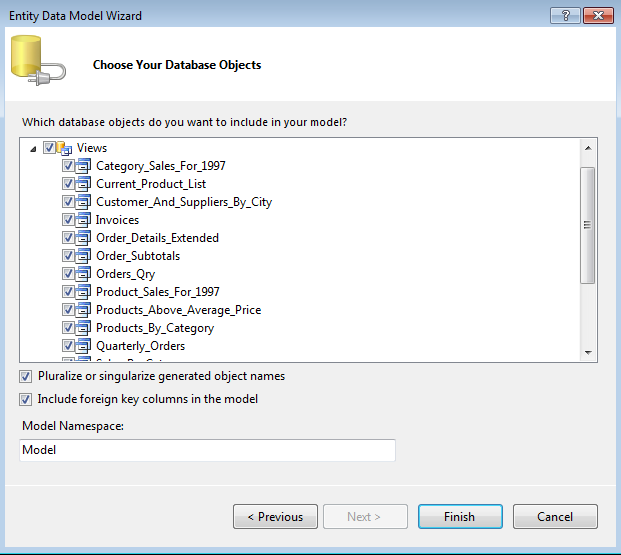 The first Data Context is an Entity Provider which is basically a class that has a property for each Entity. This type of Data Context is what the IQToolkit Tests use. The other type of Data Context is a based on a Repository Pattern which uses Generic methods instead of accessing an Entity property. 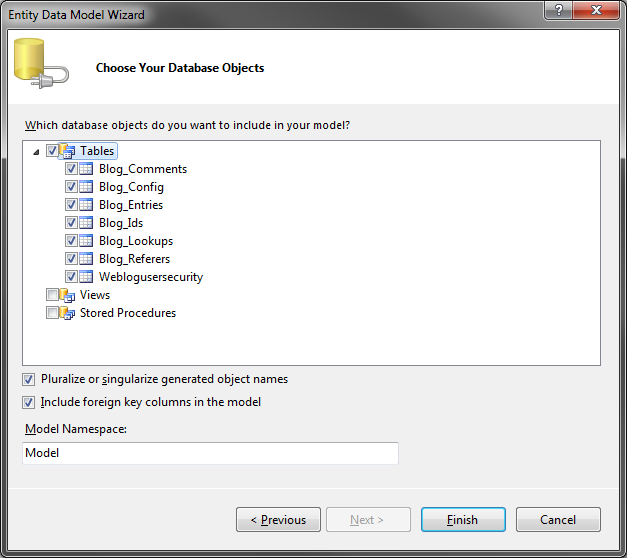 The Data Context Settings allow you to specify the class name, output file, and namespace for both types of these Data Contexts. The Base Class setting is for the Repository Data Context. The Entity Settings allow you to specify the file extension, namespace, output path, and template. There is only one Entity template available. 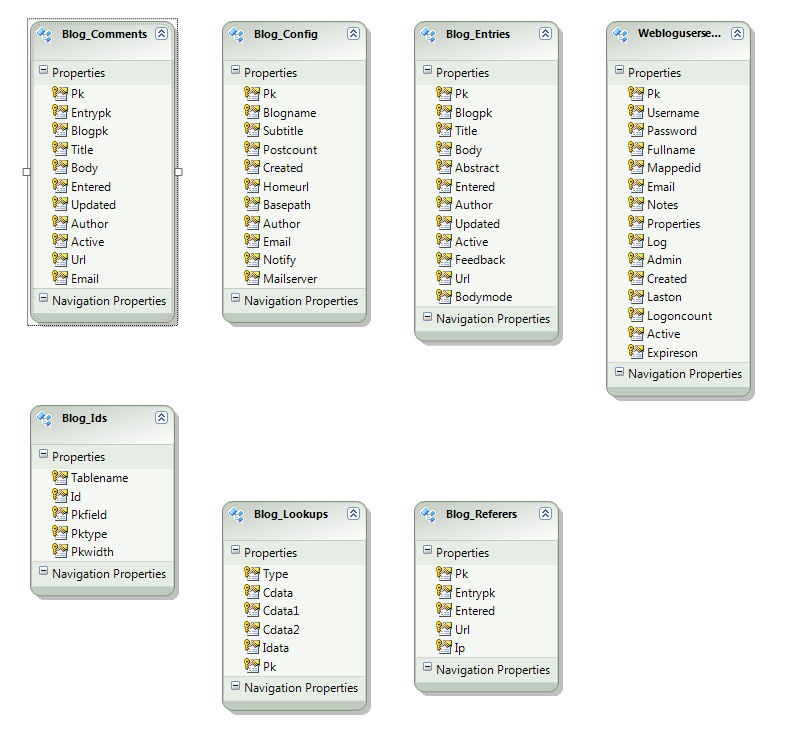 The Mapping Settings can be used to create an Attribute Mapping class or an Xml Mapping file. 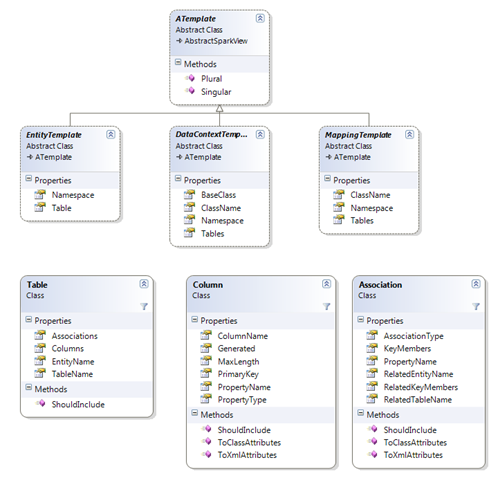 By default, the Entity Provider Template was designed to work with the Attribute Mapping Template and the Repository Provider Template was designed to work with the Xml Mapping Template. Enter all the setting values and then click the Load Data button. 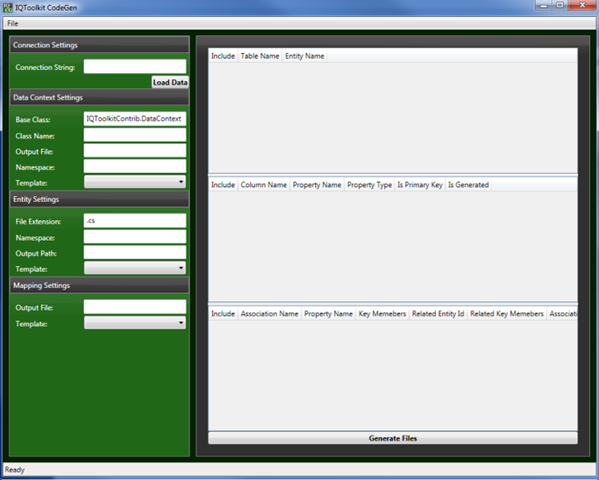 Then the grids will be populated with the Tables, Columns, and Associations information. The Tables grid is pretty simple to use. 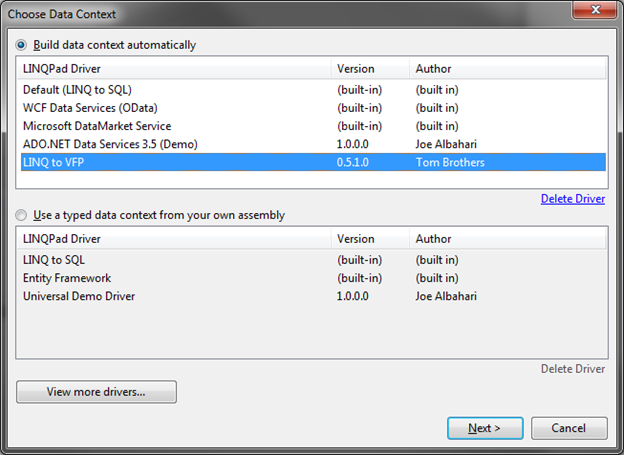 Just check the checkbox in the Include column if you want an Entity class created. The Entity class name can be specified using the grid’s Entity Name column. The Columns grid shows the Columns of the selected row in the Tables grid. This grid has a few more available options than the Table grid but is just as easy to use. 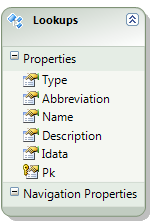 Check the checkbox in the Include column if you want the Entity class to include the property for the selected column. In this grid, you can also change the name and type of the property as well as identify the primary key and indicate if it is an auto generated key. The last grid shows the Associations. This grid has an Include column and a Property Name column that can be set. Click the Generate Files button after all the mapping information has been entered to complete the process. The template files are distributed with this application so feel free to modify the templates as needed. Additionally, if you feel that you need to add a new template just add it to the appropriate folder and it will show up in the combo box after resetting the application. This is a diagram shows the Template classes along with classes that they reference.